Yaw. Dani Couture. A Stuart Ross Book. Mansfield Press. Toronto, Ontario. 2014. Dani Couture is a poet in full and confident stride. These solid poems resonate with assiduity and authority. I am the thermometer's single glass vein. I am the dull roar of a thousand wet parts. I am a pan of burnt milk left out to cool. I am an eye tooth and a quarter short. I am keeping all the aisles and exits clear. I am a plastic stretcher on a December beach. I am thanking you on behalf of everyone here. I am the neighbour's borrowed knife. I am twin golden retrievers keeping pace. I am a street in your honour renamed. I am both the unanswered phone and the caller untethered. in the last seconds of the final quarter. These are poems you are going to want to read again, these are poems you are going to force on people who don't read poems. Couture has a fine ear for the nuance moment and a sharp enough tongue for the hard of hearing. On first go, I read this collection like a hot knife going through butter. Like a drunk cramming junk food at 3 a.m. The second read was dinner at a fine Montreal bistro. The truth is, this slim volume, Couture's fourth, is a feast. days dead and frozen to suburb sidewalk. its skin peeled back—a cool, silver skeleton. of fowl: Little Auk, Rock Ptarmigan, Red Knot. but the inward eye of Large Hadron Collider, the Higgs boson stare. but the hidden sharp end of a hem-worn story. but a hillside galaxy of failing aspen. pieces of her dark matter birthed under every porch. but the communal vibration of our silence. Yaw is a Stuart Ross Book, this imprint offered by Mansfield Press continues to pump out some of the most interesting poetry in the land. Good on them. 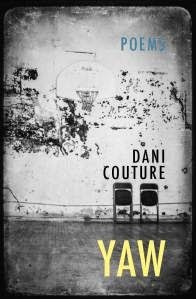 Dani Couture is the author of Sweet, which was shortlisted for the Trillium Book Award for Poetry and won the Relit Award for Poetry. In 2011, she received an Honour of Distinction from the Writers' Trust of Canada's Dayne Ogilvie Prize. Her other books include Good Meat and Algoma. Dani is the literary editor at This Magazine. She lives in Toronto. "Couture is a sensitive and talented writer and her portraits are fine and clear." "Sweet has a complexity that extends far beyond the notes detectable by our mammalian taste buds." "It is easy to borrow Couture's own words to describe hers: honed, pared, exactly cut. Her sensory, often simple, language is kept tidy with meticulous line breaks and punctuation. It's rich with suggestion and sound play..."
"[Couture has] an ear for the social ecology of humans as tuned as the one for flight patterns of birds or the eating habits of a grizzly bear. Sweet is an excellent read: short, sweet, and constantly challenging."